Is the Senate About to Pass a Law That Discriminates Against Over Half of Americans? What would you think of a law that clearly discriminates against rural Americans, lower income Americans, minorities and the elderly -- no chance of getting passed, right? Wrong. The Senate is poised to pass such a bill. The revised Dark Act, sponsored by Senator Roberts (R-KS), has been introduced as an amendment to S. 764, and would preempt the laws of Vermont, Connecticut, Maine and Alaska that call for the labeling of genetically engineered (GE) food and substitute an unconscionable, discriminatory alternative. The Roberts bill is so discriminatory it may be unconstitutional and a violation of equal treatment under the law. Polls show that close to 90 percent of Americans want to know about whether the foods they purchase were produced using genetic engineering. Several states have responded by passing laws that require a statement on the food package that the food was produced or may have been produced with genetic engineering. Vermont's law is scheduled to go into effect on July 1 of this year. But Monsanto and the major chemical and food companies now facing that deadline are doing everything they can to undermine the American people's right to know about their food. So even though 64 countries around the world have GE labeling, and the companies have to label in those countries, they have spent well over $100 million in the first six months of 2015, according to federal lobbying disclosure reports. Now they have gone to the Senate and pushed a bill that rescinds the states' labeling laws, and bans any future state labeling laws, and substitutes instead only a voluntary labeling scheme that allows this labeling to be through QR codes, websites and call in numbers rather than on package labels. Studies show that half of low-income people do not even have smartphones. So this Senate bill shuts them out of knowing what is in there food. Almost half of rural people do not own smartphones. So they are discriminated against as well. And minorities are a disproportionate percentage of low income and rural Americans so this is also discriminatory against them. Two-thirds of the elderly do not own smartphones so they won't be using QR codes or websites in the supermarket. In fact only 64 percent of Americans own a smartphone. Moreover, smartphones and data plans are expensive and nearly half of those who have smartphones have had to cancel or shut off their cellphone service for a period of time because the cost of maintaining that service was a financial hardship. Even those who have the phones and a service plan are not guaranteed consistent access to the internet, and far fewer than that have ever used a QR code--only 16 percent have ever scanned a QR code and only 3 percent of those people do it regularly. So the Robert's bill scheme to allow a voluntary labeling based on QR codes is on its face discriminatory against the poor, the rural, minorities, the elderly and other groups less likely to own a smartphone or know how it is used. This is such obvious discrimination it would seem sufficient in itself to deep six this Roberts' bill. But the Chemical and "Big" food lobby is very powerful and may have the votes to permanently hide what is in our food from tens of millions of Americans. So imagine the future if the Robert's bill actually passes this week. 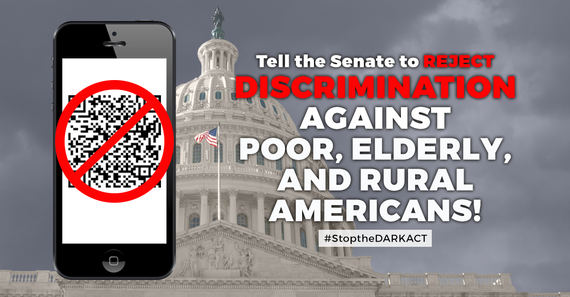 Even assuming you are among those with a smartphone and the appropriate app and the knowledge of how to use let's contrast the QR solution with on package labeling required by the states but now preempted by this bill. With conventional labeling you walk down the grocery aisle examining the products on the shelves, you pick up each one and quickly find the information you need on the package - simple, fast and effective. Now imagine that each time to pick up the dozens of products you are buying, for each one you have to pull out your phone, open up an app (if you can connect to the internet), wait for the camera to focus on the bar code, try and see whether it is GE or wait for a webpage to load, and then finally read to see if the information you need is there. Or the bill allows you to try and call and 800 number for information on each and every product you buy. That's a lot of effort to go through to get basic information that any company could easily simply have on the package. And they know it. They have calculated that excluding those that do not have or know how to use smartphones plus those that cannot spend the considerable extra time for the burdensome QR code, website or 800 number process will mean that only a small percentage of shoppers will actually be informed about whether their food is genetically engineered. Hopefully the Senate will realize that their duty is to allow all of the public the right to know and not to come up with pseudo-solutions that favor the biotech's industry's continuing drive to keep us in the dark. Proposals to use QR code technology in lieu of on-package labeling also raise serious questions about the privacy of consumer data. What data would be exchanged and how might companies be able to use that data? For instance, would a company be able to determine which customers are viewing their products through QR codes, website, or capture their phone numbers when calling an 800 number? Could they use that data to target consumers through advertising? Would any personal data be exchanged? The government thus far has a poor track record protecting consumer data and curbing the massive marketing machines of the food industry. This system only opens consumers up to further exploitation. Let's pull back from the specific GE labeling issue and ask a larger question. Are QR codes, websites, and 800 numbers the way we want food labeling to be done in the future? Whether a product is GE or not is just one of many disclosures that could be moved to smartphones or other technologies away from clear, on package labeling. So we can see that QR codes, websites and call in numbers for GE food information could set a dangerous and misguided precedent. We do not want this discriminatory, burdensome and privacy invasive technology to become the norm. The Robert's bill is therefore not part of the solution to GE food labeling but rather part of the problem. 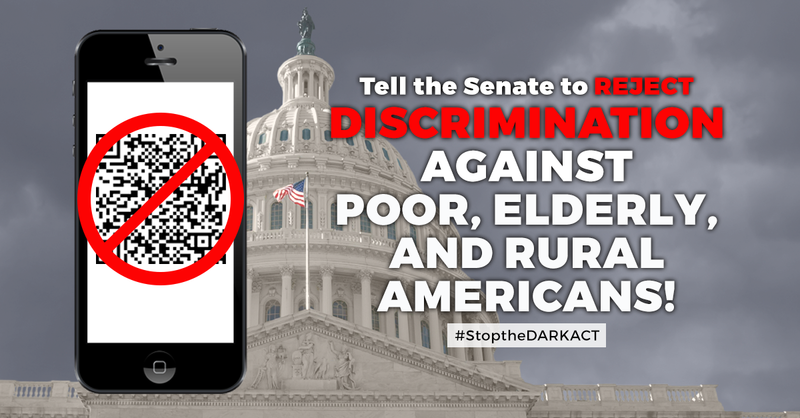 It is an unacceptable, discriminatory bill that allows corporations to continue to prevent Americans from getting the information they need to make informed choices about the food they buy and feed their families.